Human exploration of Mars won't be easy. 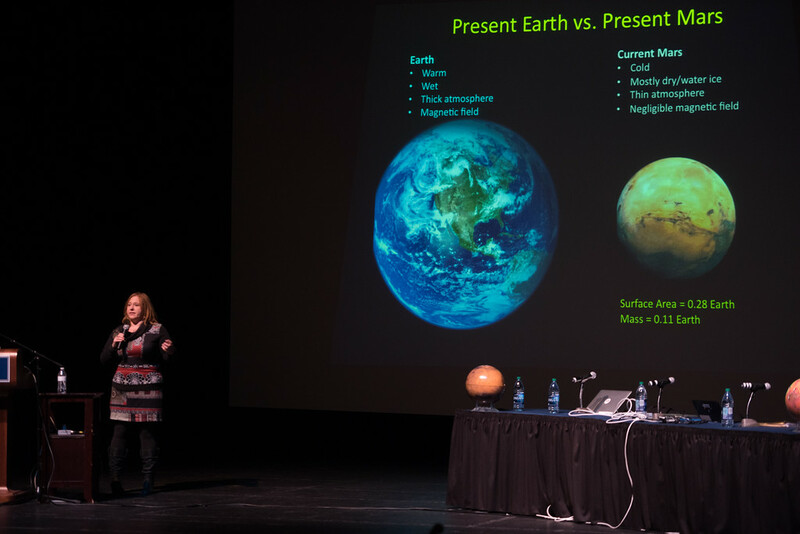 Jennifer Stern, a space scientist for NASA and Martian expert, talks about the differences between Earth and Mars during a recent astronomy forum at Southern. For those of us old enough to remember the Apollo space program of the 1960s and ’70s, the images of man walking on the Moon will forever be ingrained in our memories. It was a time of excitement, accomplishment, wonder and promise. After all, if we could make it to the Moon, then interplanetary travel could not be too far away, right? And Mars would logically be the next stop with astronauts walking on the Red Planet perhaps as soon as 1984 or 1990…but certainly by the turn of the century. Well, obviously that didn’t happen. The national enthusiasm for the space program seemed to wane throughout the tumultuous 1970s. Budget restrictions limited NASA programs. And let’s face it, in the afterglow of successful missions to the Moon, maybe we underestimated what a similar voyage to Mars would entail. The forum examined both the Kepler Mission (the search for Earth-like plants in the Milky Way Galaxy), and what a manned flight to Mars would entail. Part I of this series focused on the Kepler Mission. Today, we look at a future trip to Mars. “This (manned flight to Mars) is going to happen in the next 20 years,” Stern said. Getting and landing on Mars. – Mars has a very thin atmosphere, and it is therefore difficult to land large objects on the planet because there isn’t an adequate atmosphere to slow things down. Living in space. – On Earth, people are protected against radiation by a magnetic field. But in space, the human body is exposed to very high doses of radiation. Part of the challenge is to assess how much radiation the human body can tolerate and how that level can be mitigated. Also, because there is no gravity in space, people lose bone density and muscle mass. That has to be addressed, as well. Living on Mars – Scientists must learn how to use the natural resources of Mars to make oxygen, grow food, etc. The audience at the forum included 650 people – including 425 high school students and 30 middle school kids. It also included 45 or so individuals from nearby senior centers. While there was a contrast in age of the audience, there wasn’t much difference in enthusiasm. Young, middle-aged and old alike made a point of asking questions of the speakers. Kids growing up in the 1960s and early ’70s were excited about the prospect of going to the Moon. Some of them were in the audience. And watching the engaged high school and college students at the forum, you have to think that some of that enthusiasm will remain when these 15- and 20-year-olds are 30- and 35- and 40-year-olds, about the time that the first rocket to Mars – with humans aboard – is likely to be launched. And you have to wonder what the kids of the 2030s will be thinking when they see astronauts take those first steps in the Red Planet. Will they view that milestone the way that kids of the 1960s viewed Neil Armstrong and “Buzz” Aldrin walking on the Moon? Time will tell, of course. But if the enthusiasm displayed by the kids of 2015 is any indication, it appears to be a likely prospect. The audience also included middle school students from the Columbus Family Academy in New Haven; senior center organizations from Branford, Guilford and New Haven; members of Southern’s campus community and folks from the general public.